Whistler, BC may have established itself as a world class ski destination during the 2010 Winter Olympics, but it's still a great place to visit during the off-season. A two-night stay over Labour Day Weekend provided a relaxing last kick at the summer can before the school rush began. Always open to green ideas, we discovered a few ways to make a short stay in the village as eco as possible. 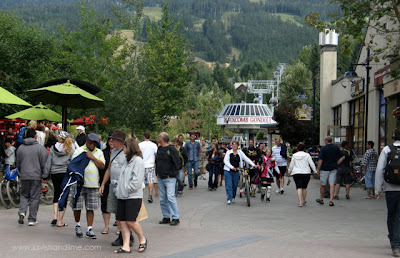 Picturesque Whistler village is a pedestrian haven. Here are five eco-friendly travel tips to help keep Whistler, BC as beautiful as Mother Nature intended. 1. Park your car and leave it parked. Whistler village offers everything you need for an enjoyable weekend stay, from restaurants and shops to grocery stores, spas, cinemas and playgrounds. The great thing is they're all within walking distance of the major hotels, resorts, condo complexes and other accommodations. 2. Bike it. To go further afar, travel sustainably by bike. If you don't bring your own, there are loads of bike rental outlets located in the village. The gorgeous walking/jogging/biking/rollerblading - friendly networked Valley Trail links 40km of paved pathways from the village to picturesque lakes and parks. For the more adventurous, there's the Whistler Bike Park with trails to suit a variety of tastes and abilities. 3. BYOB. Be sure to bring your own bottle. Cut down on landfill waste and carry your own reusable water bottles. Of course you can buy filled plastic water bottles at the hotels and stores to keep you hydrated when you're walking, hiking or biking but use your own bottle and not only will you be guaranteed a non-leaching, BPA-free drink but you'll be able to enjoy some safe, clean and great tasting Whistler water. 4. Enjoy local events. From the busy Whistler Farmers Market in the Upper Village where you'll find an endless assortment locally-produced fresh, organic goodies to runs, races, sales and fundraising dinners, check out the schedule of local Whistler events. Many of these support local farmers, artisans, environmental or animal-focused organizations. 5. Take out what you pack in. Whether you go on a hike up the mountain or take lunch to the lakeside, the golden eco rule - take your garbage with you - applies here, especially with the co-existence of bears in and around the village. Bear-proof garbage bins are generally available at the more popular venues and bear safety is always something to keep in mind while at Whistler, as well as the environment. Reusable food and snack containers are a smart option to throw in your suitcase, just in case.